Length of 8", Diameter of 4.5"
Protect your stored gear with this large and wide LensPouch from LensCoat. This lens pouch is 8" in length and 4.5" in diameter, comfortably fitting lenses one inch smaller in measurements for safe storage and transport. 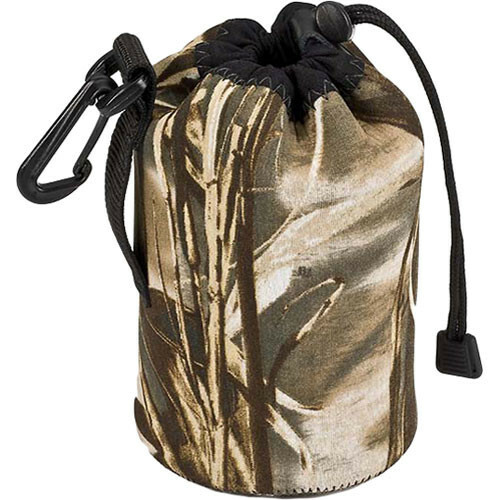 It is made of a soft neoprene material that comes in the Realtree MAX-4 camouflage pattern. Box Dimensions (LxWxH) 8.5 x 8.5 x 1.25"
LensPouch (Large Wide, Realtree MAX-4) is rated 4.5 out of 5 by 25. Rated 5 out of 5 by chris from Perfect for my Canon lenses I always keep one lens on my 60D and the other 3 stored in my bag in pouches. My recent purchase of the Canon EF 100mm f/2.8L Macro IS USM lens did not come with a pouch/case. There are several available to choose from but based on other reviewers, the large LensPouch by LensCoat seemed the best choice. They were right! It is fine for either the 100mm or my EF 70-200mm f/4L IS USM Lens which I can just about secure (with the hood on) using the draw stings. It is perfect for the price and gets the job done. Rated 5 out of 5 by Michael from A pouch is a pouch Works. Allows me to toss my long lens, 70-300mm, in my backpack without worries. Probably wouldn't protect from a 50 foot fall, but not much would. I have confidence my lens in this pouch can take anything in the way of normal banging and bashing. Much better than what came with the lens. Rated 4 out of 5 by Nicole from Lense protectors I bought a couple of these for my new Fuji lenses, but I got them without checking the exact sizes. Its ok because I have a lot of Nikon lenses. I mainly have Nikon lense pouches but I got these to distinguish the Fuji from the Nikon lenses. They are easy to use, light weight and they protect just a well ask the Nikon ones, maybe slightly thicker. They have a clip on them so if you are out you can hook them on for a photo shoot to your belt. But if your lense falls, its not going to protect it from breaking. Rated 2 out of 5 by J. England from It does the job but I have concerns! I purchased this pouch to see if I would like a belt system for my gear. Similar to Think Tank's modular belt system. I figured I would buy this much cheaper option, fasten it to my clothing belt, and try it out. So far I am pretty happy with a pouch system. This pouch's neopreme seems very nice. I do really like the firm pouch base. This pouch will not save a lens from a big fall, but it will save it from everyday little collisions. Overall the pouch isn't bad but I have had a couple issues. The two issues that I have had in the two weeks I have owned it are: 1. The hook is made out of plastic, and with a heavy lens like my 70-200 F2.8l is usm II in it I just dont trust it! I think it should be made out of metal! 2. This is small and could be an isolated problem, but the string pulled out of the end plastic within the first week and a half of using it. Not a big deal, but still kinda bugs me. I may recomend this to a freind on a budget, but for professionals that want products that will last through a beating, I don't think this product is quite there yet. Rated 4 out of 5 by scorpiorose from It does the job I bought this lens pouch to protect my 55-250mm lens. It fits just fine with room to spare. I can keep my lens hood on my lens with no problem. It is probably a little too wide. I could have ordered the regular width one instead of the wide but it does what I want it to do. It has a handy clip to fit on my belt or belt loop. It is thick enough without being too bulky. It also has a drawstring to close the top securely. Rated 5 out of 5 by William from Protection for a Panasonic Lumix/Leica 100-400 I gave it five stars because it is well made and inexpensive. However, it is too loose and baggy for the lens I want to protect. The Panasonic 100-400 seems to be of a size that nothing fits it well. This is close and will work for the intended purpose of packing in carry on baggage. I would recommend it to a friend with this lens with the caution that it is not a perfect fit. Rated 4 out of 5 by Craig in DC from Straight up simple value. This pouch is well made. The included somewhat rigid round bottom helps provide some shape to the pouch when inserting and removing lens. I'm not sure i'd trust a $1,000 large heavy zoom lens to the plastic buckle that is sewn onto the side of the pouch. But i prefer the the neoprene padding to a rigid lens case, for more compact stowing of gear. Will the large fit the Tamron 70-200mm f/2.8 SP Di VC USD? Physical size of lens is 3.39 x 7.76 inches. Not sure if the 4x8 nature of this case allows for the cinching of the bag. You would best be advised to buy the X-large instead. I have the large unit and I keep a Canon EF 75-300 mm telephoto lens in it. My lens is about 6.75 inches in length, and I have about 1.5 inch left at the top to pull the closure completely closed. Your Tamron lens would be a VERY tight fit; and possibly not have extra room for complete closure. It is possible that if you buy the X-Large unit; you may even have enough height to store the Tamron lens with a lens hood (if you use one) installed. The Canon lens I have stored in my Large bag does not have enough height to allow me to keep the lens hood on it while in the Large bag. I hope this helps you. Will this bag fit a Fujinon MK50-135mm T2.9 Lens (Sony E-Mount) that is 8.12 in length? No, the bag needs to be at least 1 1/2 inches longer than the lens to draw close nicely.